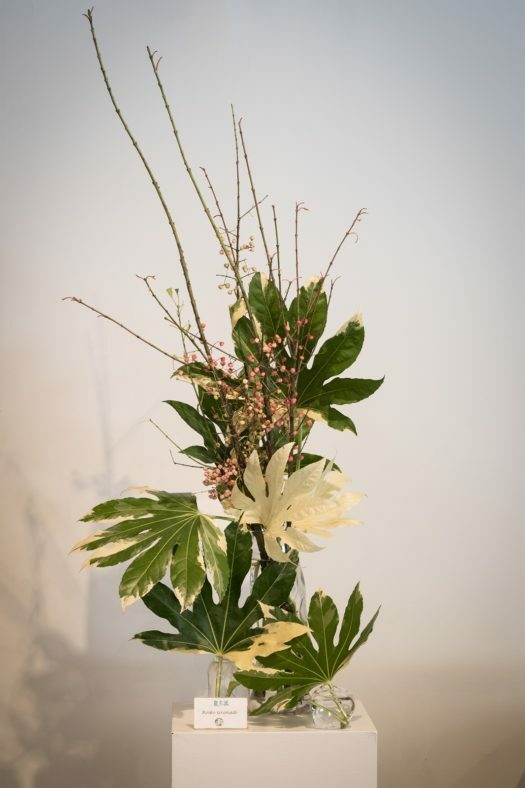 The Ohara School of Ikebana emphasizes connecting with nature season by season, utilizing the materials individual character and arranging it in a naturalistic way. The Ohara School became famous with its introduction of landscape arrangements and in its use of the colorful western flowers arriving in Japan at the turn of the 20th century. Thus, a new form of Ikebana was born called moribana. It is now known as the beginning of modern ikebana. Carolyn Alter began studying in the Ohara School of Ikebana under Sensei Kitty (Natsue) Akre in 1993. She began teaching weekly classes and founded Wednesday’s Flowers in 2012. She is a long time member of the Portland Japanese Garden, Ikebana International and the North American Ohara Teachers Association. 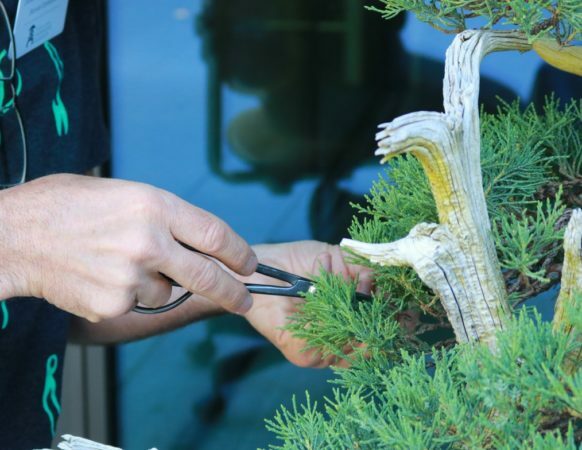 She has attended numerous ikebana conferences in the US and taken classes in Japan, chaired many exhibitions, given numerous demonstrations, and is certified as a Second Term Master of the Ohara School of Ikebana. 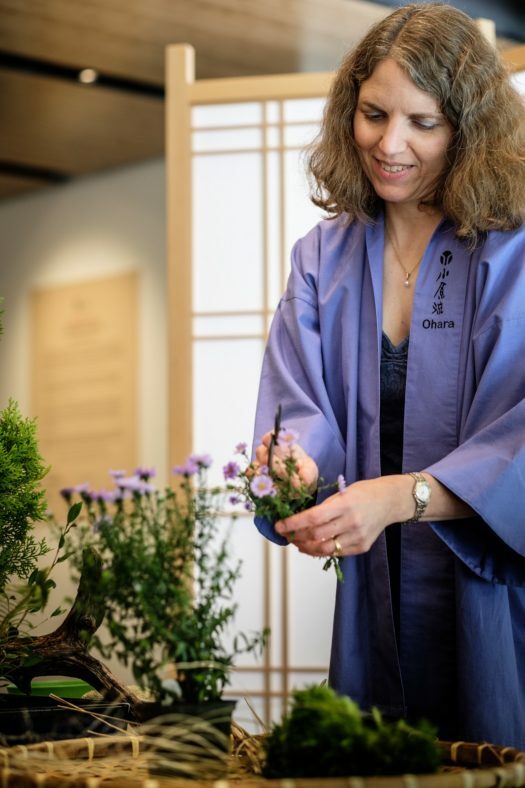 As a physical therapist for more than thirty years, she appreciates the healing aspects of nature through practicing ikebana. She loves being outdoors, gardening, and the beauty of Japanese culture. 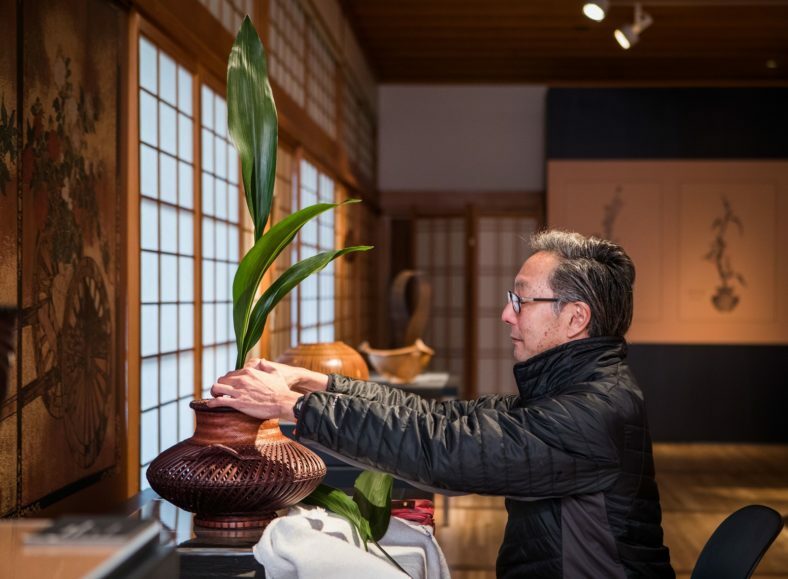 Ryusei-ha ikebana consists of the free style, in which the arranger expresses his or her individual personality, and the classical styles carried on since the school’s founding. In the free style, the designer captures the essence of the plants according to their own sensibility and arrange them however they like. Reiko is the only teaching Ryusei-ha ikebana master in the United States specializing in the avant-garde Ryusei-ha school. The aims at Saga Goryu are to be traditional but vital and to introduce visual and spiritual pleasure into daily life. 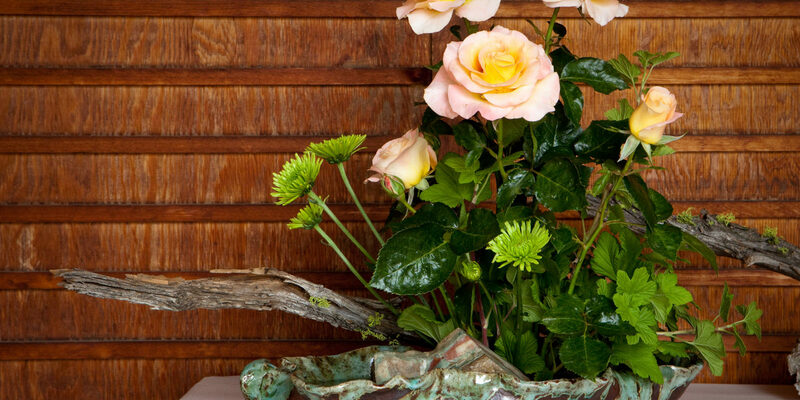 To do this, the School teaches techniques of floral decoration, and the skills to recognize the delicate beauty of flowers and their artistic value. According to Saga Goryu, ikebana is more than a classical art of ancient origin to be appreciated by an exclusive group of specialists. It is an art form that is still relevant today. Rev. 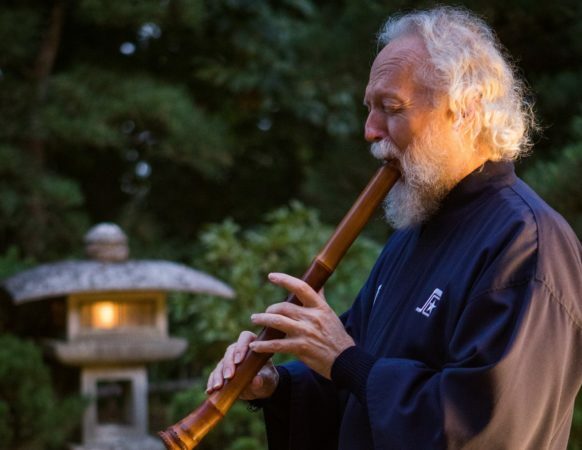 David Komeiji is the current leader of Ikebana Saga Goryu-North America Branch. David has been mentored by Master Teacher Hoin Wako Henjyoji since 1992 and has studied with many of the preeminent teachers of Ikebana Saga Goryu: Hoin Shugetsu Minami (Hokkaido Shisho cho), Hoin Seifu Noguchi (East Shikoku branch director and former director of Ikebana Saga Goryu Academy), Fukucho (former director of Saga Goryu Academy, Heian Shishocho), Hoin Etsuho Kakihana, and at Saga Goryu Kado Shoshisho Daikakuji. Through the teachings of these instructors he has achieved the current status of Soumokudai (Senior Professor). The Sogetsu School is distinguished by its free style and abstract arrangements which use objects of sculptural intent and character. The three main elements designers use are line, mass, and color, with an emphasis on the designer’s individual artistic expression and creativity. 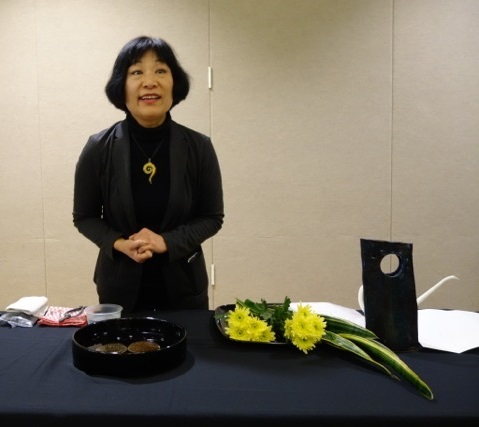 Nana is originally from Japan and is the current Director of the Portland branch of The Sogetsu School and the past President of Ikebana International Portland Chapter #47. She has been actively exhibiting, giving demonstrations, and teaching classes and workshops at various venues. Her goal is to inspire and intrigue people with ikebana. Nana graduated with a Bachelor of Arts degree in English Literature from Dokkyo University in Japan. She continued her education and received two master’s degrees — one in Agribusiness Management and the other in Political Science from Mississippi State University. Since 2011, Nana has been teaching Japanese Culture at Mt Hood Community College. Nana is an active community member; she participates in Portland Connect, Leach Botanical Garden, Japan America Society of Oregon, and the Sogetsu Ikebana International School (Portland Branch).